When we got home with the kids a little less than two years ago, everyday life was just a sun-up to sun-down survival. From figuring out meals for seven (after 16 years of being used to fly-by-the-seat-of-our-pants meals for two), to figuring out bedtimes, setting up boundaries, and learning what it means to be a family - everything was a struggle. By the time 8 o'clock rolled around, I was operating on auto-pilot, just praying that God would keep me going until I could fall into bed and do it all again the next day. That, my friends, is the reality of adopting five kids (ages 4-12) at one time. Fortunately, life has gotten a lot better over the last few months, and we've all settled into a routine that works. Meals are no longer stressful, homework is done without much complaint, and the clutter is slowly coming back under control. However, one of the places that has remained in chaos has been my walk-in pantry. Until recently, we had a "no entrance" policy for the kids (one of those fantastic boundaries that we set in place until everyone had figured out how to behave), which meant that the pantry became our catch all for... well, just about everything. The kids went back to school two weeks ago, and I've been playing catch up on all the tasks that I'd been putting off all summer. That include a thorough pantry clean out and reworking, which finally happened this week. On Tuesday I pulled everything out of the pantry and started over, shelf by shelf. I ended up with a full sack of garbage, and a full bag for the charity shop as well. As the shelves cleared out, I realized that my pantry clutter was actually costing me money. For example, I won't need to buy salt for the foreseeable future, as I have four bottles and two bags of it! I don't need to continue to buy small jars of cumin, because I have two industrial size bottles that had been lost behind other items on the shelf. On Friday I paid a visit to TJ Maxx and picked up several storage bins to help organize what remained. While the kids watched a movie last night, I hid away in the pantry, creating sense of calm organization on the shelves. The result might not seem like much, but suddenly, I know where everything is. I know if we're getting low on something, or if we're out of something. The Hubs (who does as much cooking as I do, if not more) walked in, took one look, and loved it! When we needed hotdog buns for lunch today, he knew right where to go. When I used up the last of the ketchup, I knew where I could find our replacement bottle. It's only been a day, but I'm already in love. HEY THERE! 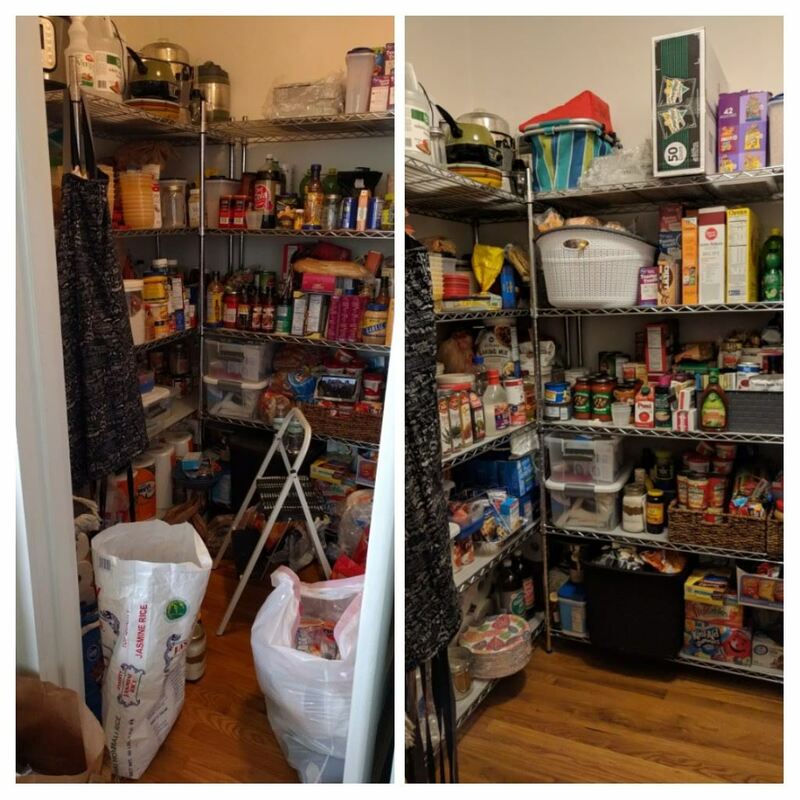 If you're interested in getting help taming the clutter in your home - whether it's hidden behind a pantry door like mine was, or out in plain sight - registration for the fall session of the uncluttered course from becoming minimalist blogger, Joshua Becker, ends tomorrow night. It's a hefty fee to sign up (about $80), but it's a lifetime membership and you can take the course any time it's offered (and he offers it three times a year). I've signed up, and I'd love for you to join me (note, it's an affiliate link and I get a nice sum back if you sign up through my link). Register today, join me for class on Monday!